Brake Disc Gaging System | Cincinnati Automation Ltd. This system was designed to weigh and then measure ID, OD and thickness of a family of large brake disc used in the aircraft industry. The system was programmed to automatically calculate and store certain key manufacturing characteristics of customer's parts between processes. 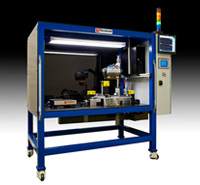 Three sets of Keyence LJG series precision line profiling lasers were used to gage the parts. The laser sensors were mounted to programmable servo cylinders for precise positioning around a range of disc sizes. A rotary dial table was used to move the disc into multiple positions for several measurements and results calculations. The PLC/HMI included operator configuration settings for part size, weight and pass or fail range criteria. The control system automatically displayed and recorded results data for each part tested. The system included a positive air purge and dust guarding covers around key components.